I was exploring both personal symbols and was attracted to the colour viscosity printing process which I was able to explore at the University of Windsor. 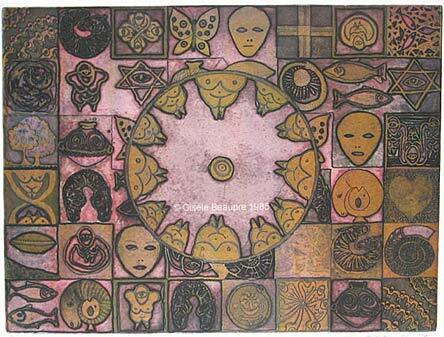 In this print I used a combination of personal and universal symbols suggesting varous spiritual references. I was influenced by Carl Jung's view of symbolism and the collective consciousness. Plate Size = 18 x 24"